America was discovered and colonized by Europeans. Language, culture, religion, economy – the complete social system origins from European structures. Even the name derives from the Italian navigator Amerigo Vespucci. European emigrates established a kind of „United States of Europe“ on the American continent. Europe found its fulfillment in the “New World” whereas the comity of nations on the „Old Continent“ tore itself apart in countless wars. today already partly reality but still plenty of vision. On the occasion of the 100th anniversary of the declaration of independence, France donated the statue of liberty to America. Today Europe is in the process of creating a common constitution. 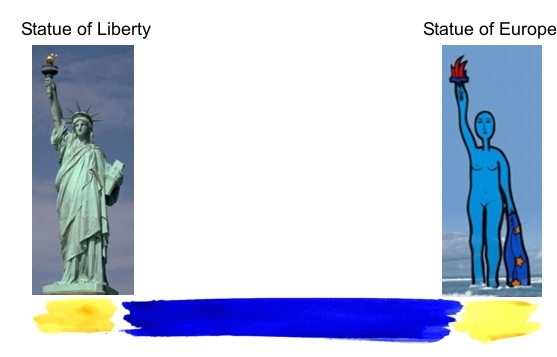 The Statue of Europe symbolizes this newly created Europe and the victory of freedom in Europe. The base is the common cultural identity. Jean Monnet, initiator of the Coal and Steel Union (the foundation of the European Community), once said: If he could re-start the creation of Europe he’d begin with the culture. Europe needs an a portray of its identity, its common origin. The 46 meters high Statue of Europe enters the European continent on the Atlantic coast and symbolizes: Europe - the soul of the statue of liberty - moved from its plinth in New York and returned from America. Now she is wandering over the old continent: from France via Brussels (the political center of Europe), Germany, Italy, … to Poland, Hungary…, and with relevance to the present, up to the Ukraine. A portray of the soul of the new Europe. Steel-Glass-construction: a frame of steel forms the outer shape of a bare female figure, the figure itself consist of perspex ( i.e. Macrolon – extremely resistant). A magnificent female figure, modeled according to a classical Greek statue, walking forth. Arising from the sea, she walks towards the land. black. To increase the sculptural effect maybe shadings will be applied (half-tone dots: Andy Warhol/ Roy Lichtenstein). The steel frame is colored black. European flag – this aspect remains unanswered). The golden torch and the golden stars refer to each other in regards to space and content: looking at the torch with the flame of freedom, everybody adds in thoughts some more stars. - during tide the water stands up to her knees. The sculpture has two different front views: she walks into both directions. The glass sculpture casts a blue shadow. Illumination of the glass surface. Only the blue female figure can be seen, the black steel construction is hidden in the darkness. 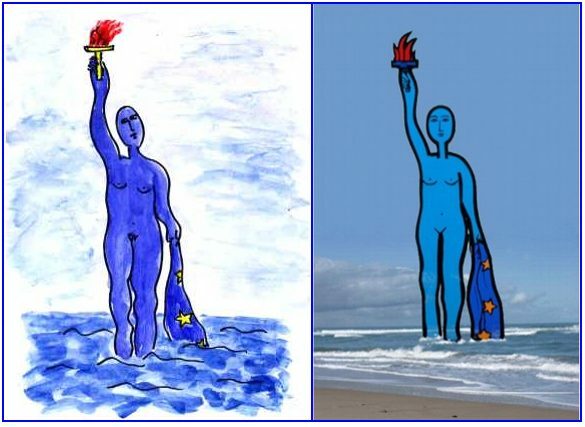 The Statue of Europe rises mystically from the sea (Venus, die Schaumgeborene). 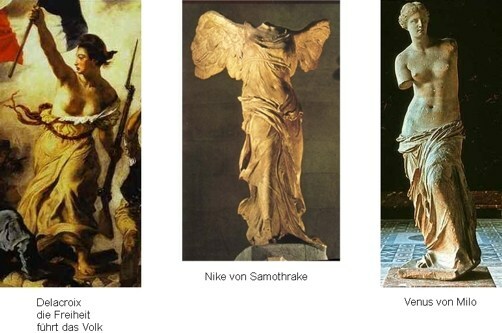 Europa is portrayed without the Taurus. Europa is not a girl anymore, kidnapped and seduced by a Taurus, she is now an adult, self-confident woman. - During the mediaeval mysticism blue was not meant to be a color but represented quite simply the light (Fra Angelico). In France, on the beach of the Normandy, where the landing of the allied forces took place. Respectively on the beach of the Bretagne near Brest, the most western part of the European continent. Europe enters the European continent on the Atlantic coast and wanders through Europe. 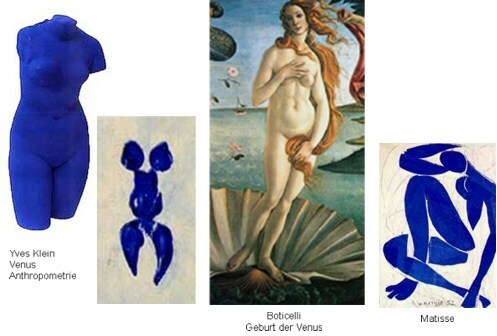 Variations of the Europe statue are planned – where appropriate, in a blue dress respectively with a Taurus i.e. on Crete or as a female torero in Spain. Already during World War I, in the dugouts of Verdun, the soldiers longed for Europa as protective goddess, making war between the European nations impossible. The Statue of Europe strides self-confident towards the future and stands for the idea of freedom and humanity. Coming from the „New World“, she symbolizes the “New Europe”. But still she proudly carries the “Old World”, the “Old Europe” within herself. For sure such a Statue becomes a Tourist Attraction and conveys especially for the younger generation the European idea. Europe returns to the European Continent. 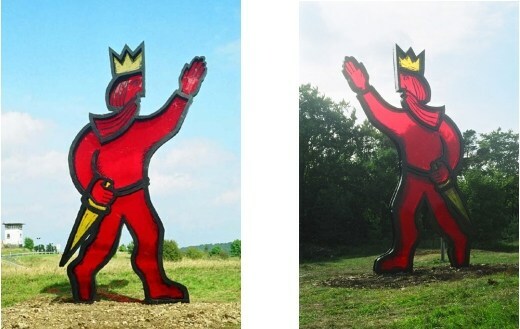 The sculpture „Barbarossa“ clarifies the construction principle. 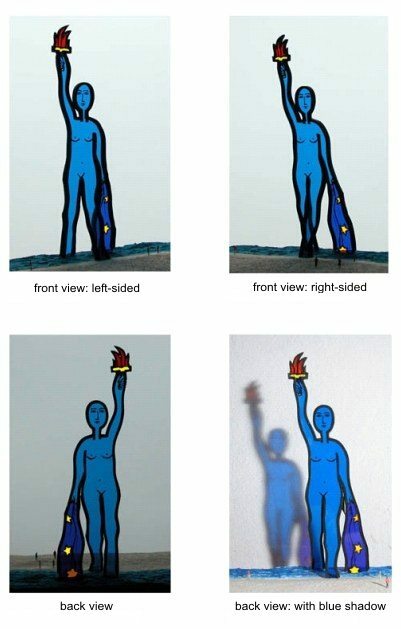 The Statue of Europe will be constructed accordingly. The stability is ensured by the heavy outer frame. The depth of the frame is 8 in. The glass surfaces consist of Macrolon, 0,8 in thick (this material is extremely resilient). The sculpture “walks” on the ground – the foundation is hidden beneath. The watch tower of the former border fortification between the Federal Republic of Germany and the former German Democratic Republic is visible in the background.